I was looking for a quick way up this hill as I only wanted to bag it. I headed on the R756 from Hollywood and took the turn right onto the third class road. At approximately N 953 038 A I turned right onto an uphill track. It was just wide enough for the car and twisted up to a level area big enough for a few cars. I got the sense no one had been here for years. Walking back down the track for 20 metres I turned right and walked up through tall grass and over an embankment. I found myself on an old track from logging or something. It was quite churned up but easily negotiable and dry. A few minutes brought me to the unofficial relay station mentioned by csd before. It looked like a weather station to me. The summit proper is over a fence. padodes and csd's posted photos show the summit quite well. 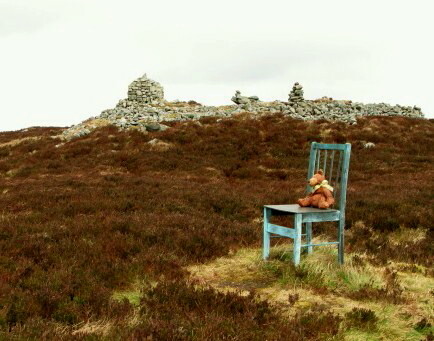 However I think the lonely Teddy on the bronze chair deserves more attention. 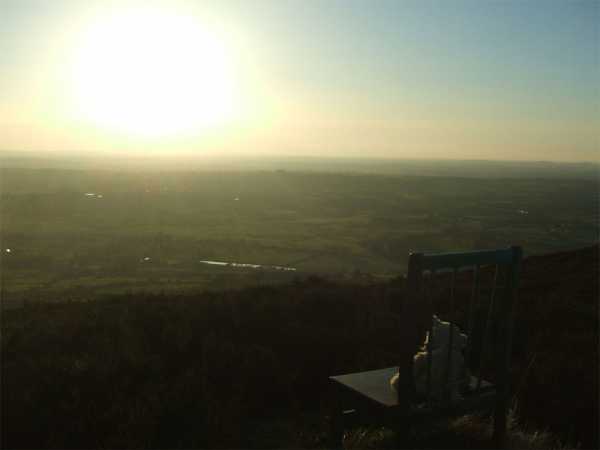 My photo shows his lonely vigil looking over the lowlands below. 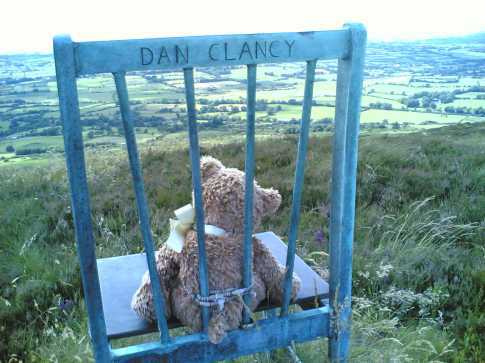 The name Dan Clancy is clearly visible engraved into the top of the chair and a man's silver ring was added into the chair during construction. This can be seen at the bottom of one of the four rear bars. 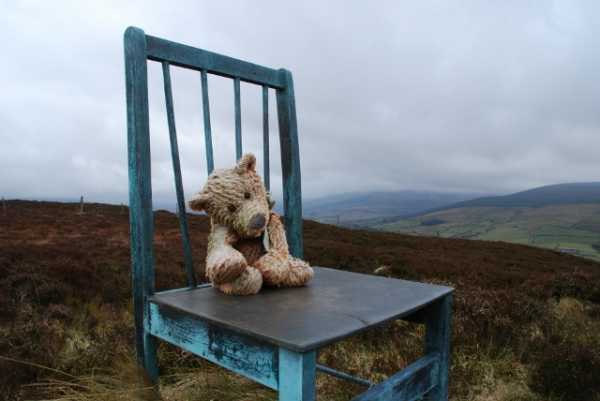 I got an incredibly sad and nostalgic feeling when I saw the bear, as I thought about him sitting there day after day, season after season presumably in memory of Dan Clancy. If it is a memorial I think it is lovely but I wish Teddy had a companion for company. He even looked like he had been treated with waterproofing or something and was bone dry. Picture from csd : The view to the west from the summit. 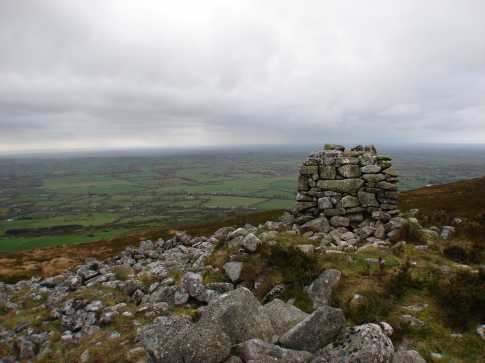 Picture: The view to the west from the summit. 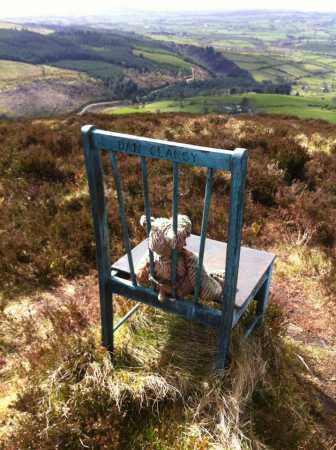 New to hill walking (since February 2012), I've been eager to visit Teddy since I first read about him on these pages. We approached the hill from above Hollywood (point C). There is a parking symbol on the East West map but the farmer there ousted us despite our friendly and polite inquiry. We parked at the road side instead.